Yggdrasil gaming is a leading online casino software provider. This software platform is widely being used by top and most popular online casinos of the world and hence they always try to offer great slots to players looking to play online slots for real money. 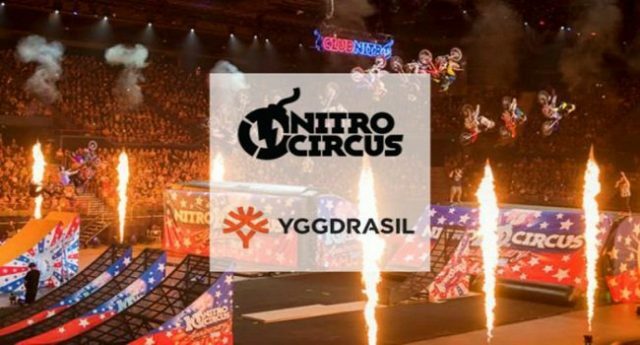 In addition to that Yggdrasil gaming has developed an online video slot named Nitro circus. This is 5 reels and 25 Paylines (ways) video slot game powered by Yggdrasil Gaming software platform. Total coin sizes for the game is 10, however you can play this lovely 7 amazing slot using your desktop, mobile, smart phones or tablets at any Yggdrasil Online casino for just 10p per spin to up to €125 per spin. The game offers a jackpot of 500 times on your total stake and has 3 different kinds of bonus rounds including free spin bonus feature and multipliers. The free spin bonus feature can give you up to 30 free spins after being triggered and up to 3x multiplier. Nitro Circus is a beautiful slot game developed by Yggdrasil gaming. The game has plenty of new things to offer to its players. The game contains stars, vehicles and greatest stunts. The game comes in with a Nitro Jump feature where you could win multipliers cash prizes by flying through 1 of 7 vehicles. This is the craziest thing you would do in a slot game. You have already seen this kind of stunts to different circus but believe me “this Nitro Circus slot game is definitely a wonder”. Nitro Circus slot contains symbols like different kinds of helmets and 4 different riders. The guy with the red helmet is the highest paying symbol of this game which would offer you 50 times of your total stake if you land 5 of these symbols across a payline. The game also comes in with a wild symbol which would replace all other symbols. Another important symbol of the game is Nitro Bomb symbol and if you lucky enough to land 2 of these symbols during base on a single spin then you will trigger Nitro-Blast Minigame feature and then you can choose 1 out of 5 bombs to get following prizes. The free spin feature will award you 10 to up to 30 free spins. If you want to add 1 vehicle to your collection then you will add a toy car, a couch or bathtub. The next thing you could explore or choose is the Nitro Wild. And if you choose this option then it will turn 2 and 9 symbols to wilds. The free spin Multiplier will increase your multiplier up by 3 times and extra Free spins will get you 1,2 or 3 more free spins. The game has a scatter symbol as well in the form of Bomb. And if you hit 3 Nitro bombs then you will get 10 free spins. 4 Bombs will get you 20 free spins and 2 feature picks, while 5 of the scatter symbols will award you 30 free spins along with 3 feature picks.